I'm playing catch up with my walks and failing miserable to get each one written up and posted so please bear with me, I will get there. I have all my notes and photographs. It's just a case of making sense of it all and putting it into some semblance of order. This one especially it was back in July; one day, a Saturday with 3 separate walks and a kind of off piste, machete requiring non walk hack around the undergrowth or more accurately the overgrowth to a fairy dell. I've decided to scratch from my post. It would just be crazy to suggest walking there. Over grown like a jungle and no real distinct path or markers to follow. I think the Galston fairies want to keep the place to themselves. I've decided to split it into 2 posts for the 3 walks. It started earlier that week in July when I got a text message from my friend, Phil asking if I fancied going for a few walks in glorious Ayrshire and an over night camp somewhere. I couldn't make the over night but I could meet early on the Saturday for a walk. Deal sealed. Phil suggested we do a couple of walks at Straiton. I was happy with that as it had been a long time since I was down that end of the county. Saturday came and I was up with birds, nice and early. I left my wife and daughter sleeping as I crept out the front having got most of my gear ready the night before. First stop was breakfast, I needed some of Mucky D's pancakes and syrup to plan my road journey out in my head. What would be the quickest way to Straiton from East Kilbride. After 8 mints of exile from god's country I still find I have to re-wire my brain for the roads. I have to plug in the South Lanarkshire section. Crazy but that's how it works for me. I was trying to figure out my quickest route. I ended up going the easiest road the A77 down to Ayr then head for Patna and Dalmellington, the A713 and then along the B741. A favourite of mine, a great drive from New Cumnock but I wasn't going that way. 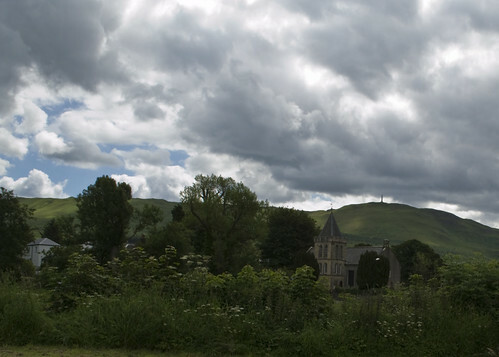 I could have gone the Kirkmichael way when I got to the back-end of Ayr. One of those 6 of one half a dozen of the other. I made Straiton in good time to find Phil in the car park waiting. It was fine sunny morning that had made for an excellent drive down and would hopefully make for a good walk. We got out the cars and set about getting ourselves sorted. Which involved; on my part, some heavy handed lathering on of high factor sun scream to my face, arms and any exposed skin. Liquid asbestos is the factor strength. The bane of being a fair skinned Scot. At this time of the year the sun need only wink in my general direction and I end looking like a skelpt erse or a bleisha beacon. There's ginger in my genes and not just from the IRN-BRU. We head up into to the village and to the village store for some supplies. Passing the old 16th Century church. I had been lazy earlier and not made up anything for lunch. I asked the man behind the counter if they had any filled rolls. No, not the answer I was expecting. I had to make do with a couple of sausage rolls and some IRN-BRU. Not that the sausage rolls were bad, far from it. Locally made, straight from the butchers or the farm. However I do think the shop is missing a trick or two. Freshly made rolls, even if they are to order surely would bring in a few more bob or two? Surely? It's not that didn't have the ingredients. Leaving the shop we headed up the main street past The Black Bull Hotel. A good place for a decent pint and feed but it was a bit early for that. It wasn't open either. 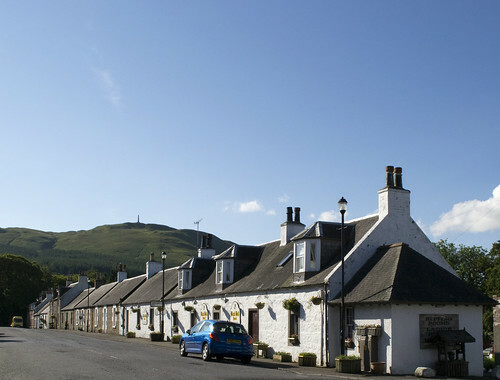 It's picture postcard stuff here, rows of well kept single story cottages a running along a wide main street. Probably all down to the Earl of Cassilis deciding he was fed up of playing with toy houses and wanting to play with some life-sized models instead. None-the-less still pretty in the sunshine. From the main street we got a great view of our first target for the day. 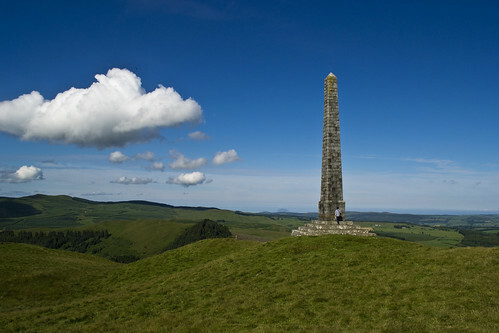 The monument atop of Craigengower. Continuing on through the village we headed on out the other side on the Newton Stewart road. Following this road out past the Manse and the old toll cottage to the primary school where we left the road through a gate into a field otherwise known as fly central. The air was thick with them, might have to do with the fact that the small field was presently being occupied by both a herd of cows and sheep. Plus the sun was heating the place up very nicely indeed. We followed a very obvious grass path through the field. Dodging coos and scaring the yowes. Well they are jumpy by nature and doesn't take much encouragement to get out your road, other than being closer than 3 feet from them. The grassy path cuts across the field then curves round to follow round the boundary with the wood until we get to the gate which leads us into a path in the wood. Along the shaded path through the woodland which looks like it also doubles as a fire break for the conifer forest. This leads us to a drystaine dyke with a stile. Climbing over the dyke by way of the ladder stile we find ourselves at the bottom of Craigengower. It's almost straight up vertical from here to the monument. Okay maybe not vertical but it's a steep a section as you'll get anywhere. Out of the shade of the trees it was getting very warm indeed. Just what my unfit body needs to go along with a nice bit of vertical leg pumping. Onwards and upwards we go. The path is well marked and worn. I'm not saying it gets well used or often but it's getting some use. Maybe even if it's just the sheep. Phil is bounding on like a mountain goat, skipping up the slope while I'm hobbling like a one-legged pirate with a wooden leg and a crutch or so it seems. I say it every time, I need to get fitter. Maybe one day I'll listen to myself and find the time. Phil has disappeared over a false summit so I take the opportunity to take a breath and grabs some photographs. By this time the heat plus the steady steep incline and my physical conditioning have combined to create a greasy liquid asbestos coated sweat. You could quite possibly power cars with this stuff. I'm in mortal fear that the combination is going to spontaneously combust so I decide to remove my glass and wipe down my face. It seemed like a good idea at the time. That was until I opened my eyes and blinked. It would appear that all I manage to do was to move the slick oil in the sockets that house my eyes. Oh yes it nips. It nips nippier than a nippy crab with a big nippy claw. I have now lost the mortal fear of combustion only to replace it with the mortal fear that I have just blinded myself. You would think after all those years I would have learned the lesson that eyeballs and sun cream don't play nice together, EVER. After what seems like much rubbing, blinking, wiping, half a litre of water and much much cursing and chastising of my stupid self the stinging has eased enough that I can keep e'en open long enough for me to see and continue my walk. I have no doubt that had there been any witness it would have been a hilarious dance to see but luckily no-one did. Until now. I also have no doubt Phil was wondering what the hell was keeping me. Fun and games. I continued on, I was closer to the top than I realised. I soon reached the summit and a glorious view and not just the impressive monument to the late Lt. Col. James Hunter Blair. I know very little about the Lieutenant colonel other than he was mortally wounded at the Battle of Inkerman in 1854 which was during the Crimean War and the family seat is just up the road at Blairquhan. Only because it tells you that on the monument itself. 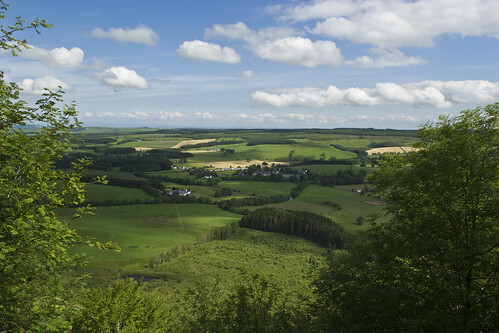 The view was panoramic and stunning, the fine weather helping no end. Blues skies dotted by powder puff clouds. All points of the compass had views. To the north Ben Lomond's distinctive shape was clearly visible, 60 or so miles. 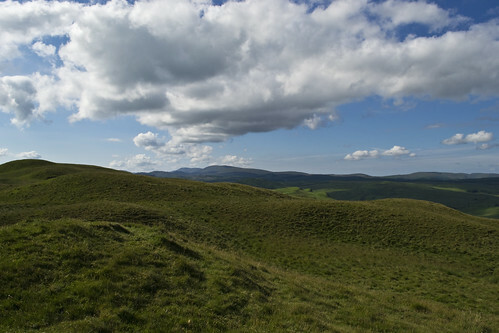 To the east was the Southern Uplands rolling away and more particularly the Glenkens with the Cairsphairn hill tops visible as well as Blackcraig Hill at Glen Afton. Off to the south the Merrick, king of the southern hills, with Trafessock and Kirriereoch Hill guarding the approach from this view, two fingers of the Range of the Awful Hand clear visible, only being 12 miles away. Finally to the west the firth of Clyde and the sea with the Ailsa Craig, the prominent volcanic plug standing strong in the water. Everywhere you looked there was something for you to see. Well worth the effort and the near self inflicted blinding of the upward climb. We sometime milling around the monument talking in the views, capturing some photographs and taking a water break. Generally just enjoying the day. Phil checked the map for our next destination and what our general heading should be so together we walked off the summit to the first wooden way-markers. From there on we went from pillar to post heading south across the muir before making our way down to the road. We crossed the road and made our towards a road bridge following a semi overgrown path that follow the rivers edge. It was thick in places and we were kicking up clouds of pollen, turning the sunlight hazy around us. Luckily neither of us suffer from hay fever. Reaching the bridge we headed right and on to a grassy path which lead us in to Bennan Wood again we following the way-markers provided. I love walking in the woods and this was no exception. Nice mixed plantation. Plenty of wildlife to spot and another deer that we managed to scare before I can get my camera up and in place. I'm starting to think I'm not going to get a photo of a deer. I've lost count the amount of times I've been out walking and stumbled into a deer or 3, only for them to hightail it out of sight. It be useless hunter. My tribe would go hungry. Continuing to walk through the wood skirting the bottom of Bennan Hill. Enjoying the dappled sunlight filtering through the canopy we get to a marker pointing to a viewpoint. We follow this steep path which turn us almost back in the direction we came. It's not the best here the path has been moved and destroyed by the tree roots and little up keep. It takes a while to find the vantage point once we get to the top. It's another fine spot for a rest and some photographs. We return down the same path as climbed back to the path at the base of the hill turning left. Leaving the woods we find ourselves on a farm track which leads us through Bennan Farm and onto the road. Following the road till we come across a sign for a footpath which we follow. This takes us along the river bank again for a short distance before crossing a footbridge over the water to find ourselves back where we started. In the car park a little over a couple hours after we left. However we were not finished with Straiton just yet. Oh no. Dumping the rucksacks in the cars we were off after Lady Hunter Blair. Having dealt with the Col. it was only fair that we should go after his lady. It was only going to be a short walk. This time heading out in the opposite direction. He headed past some of the old cottages, catching a path leading over a small burn and onto what is the Dalmellington road. We follow the road again till the way markers indicate we've to enter the field. This where we make a bit of a mess of things. Not really our fault. So Phil and I walk across the long grass swarmed by flies again, except this time its worse. No live stock means we're the only ones the flies are interested in. Lovely. It becomes apparent that somethings not right. We reach the other side of the field; no more way markers, no visible or obvious path. Our choices are; loup a fence, that doesn't seem right, wade through a burn, that really doesn't seem right. Its meant to be a managed path but there is no path. We get the guide out but its not the most accuracte or detailed. Oh deary me. After much walking up and down the fence line, pointing, chin rubbing, general gesticulating and discussion. We discover the path that we should have followed is squeezed between the fence along the roadside and a horrendously over grown hedge. As in so overgrown you couldn't see the path because it looks like some put a fence up in front of a hedge minus room for the path. Sure enough though we find an extremely well hidden way marker. In the name of the wee man, I've found easier Geo caches. Seriously. I let Phil go first to push as much of the undergrowth overgrowth out of the way. Then I follow behind, hands above me head to protect my face as most, if not all of this stuff is taller than me. I'm like a quarterback with his centre in front defending him from tackles. In this case its not other players but getting whipped and scratched by the hedgerow. It doesn't take us long to clear the worst of it and enter into some really pleasant woodland. 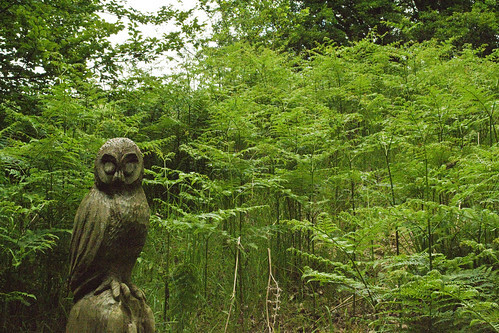 This woodland walk was short and sweet but filled with carvings and wildlife. The carvings are of different animals found in the woods and countryside. You follow path up onside of the river and down the other side. Not the most arduous of walks but still a nice relaxing one if you only have a hour or so. On the way back to the car we opted to walk down the road and not the hidden path. Straiton done it was time for our next destination......and another post.